Bhogi is the first day of the harvest festival Makar Sankranti or Pongal . It is celebrated in honour of Lord Indra- the god of clouds and rain. 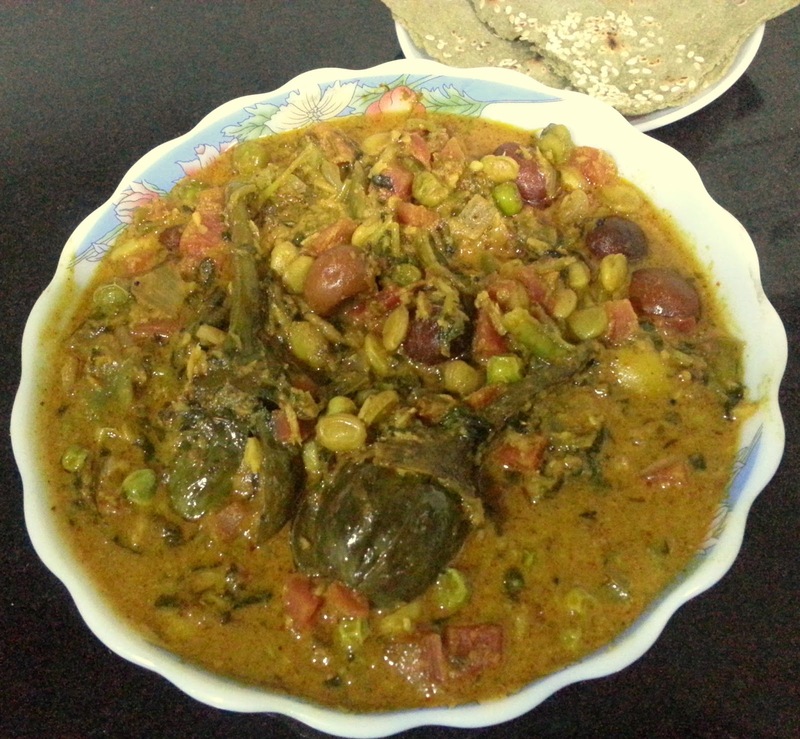 In Maharashtra a special traditional mix veg curry, very similar to Undhiyo is prepared on this day along with Bajri chi Bhakri and mung dal khichadi. 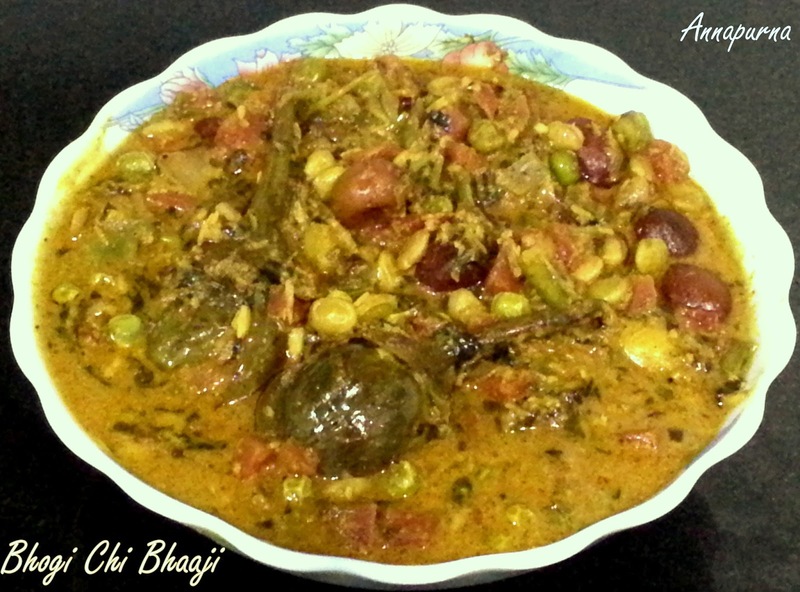 Bhogi chi bhaji is also known as Lekurwali bhaji in Marathi and is made from seasonal fresh vegetables. It is a gravy dish made using sesame seed powder , roasted peanut powder and grated coconut which provide warmth in the winter season. A lip smacking and healthy mix veg curry dish to try out this winter ! 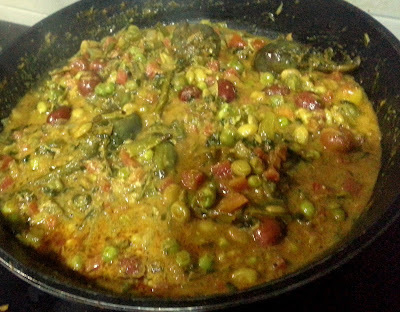 1/4 cup finely chopped fresh Fenu greek leaves / Methi leaves. Shell the green Peas, green Chana and Lima beans from the pods. Clean the flat green beans and make roughly 2 inch pieces with your hand( both the green shell and seeds are edible). Wash and make 4 cuts on the brinjal taking care not to cut the brinjal apart. 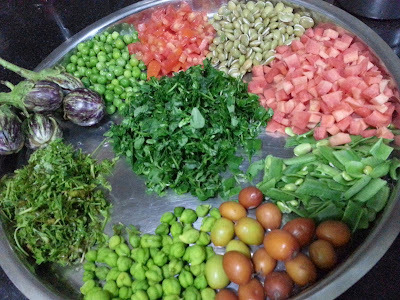 clean , wash and finely chop the coriander and fenu greek leaves. Similarly wash and chop the tomato and carrot. 2. 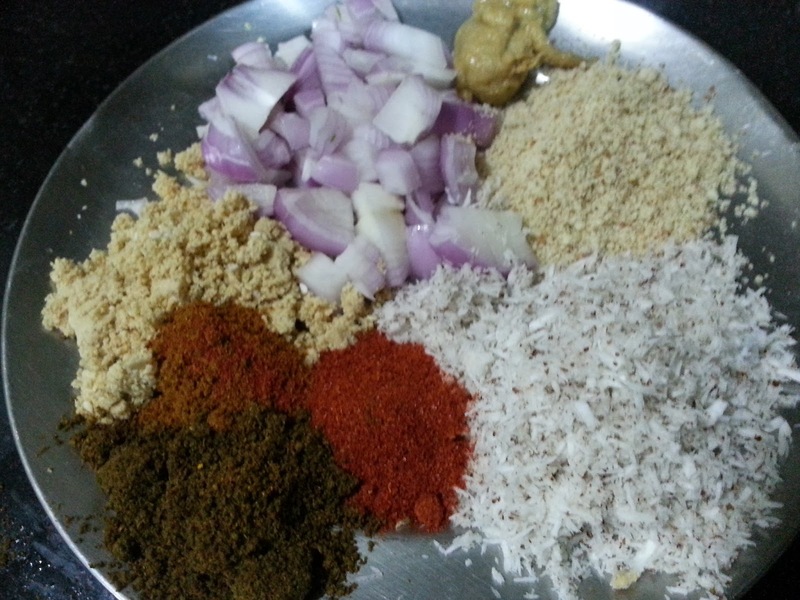 For making the masala , take all the items listed under masala ingredients except the Jaggery in a plate. If making this Bhogi chi Bhaji for Naivedhyam / Bhog , do not add the onion and ginger garlic paste. 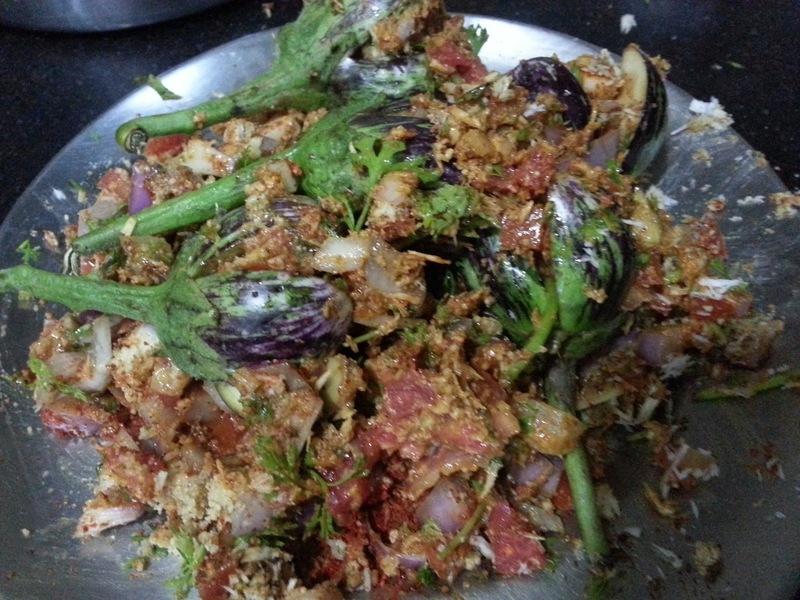 Add tomatoes , fenu greek leaves and coriander leaves in this masala, mix this well , and stuff into the brinjals. 3. 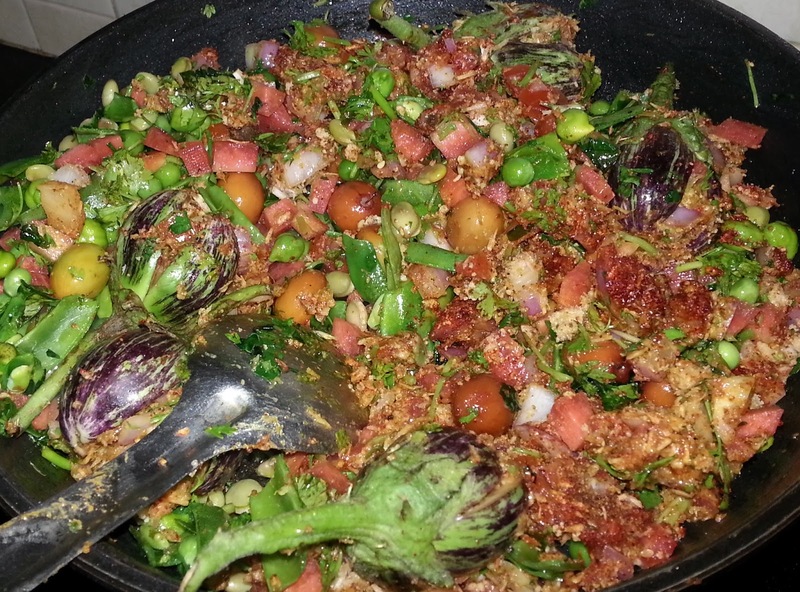 Put oil in a heated pan , add the cumin seeds. Once the seeds splutter, add the hing and turmeric powder. Add the stuffed brinjals, remaining masala and other veggies to the pan and stir for about 1-2 minutes. 3. Add 1 cup hot water , give a quick stir and cover the pan with a lid. 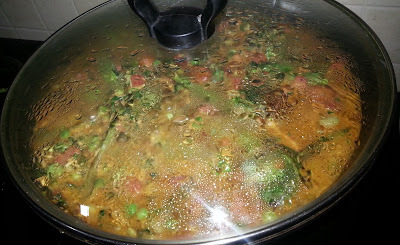 Let the curry cook for 15-20 minutes or until all the veggies are done. Keep stirring in between, also check for water and add little hot water if required. 4. 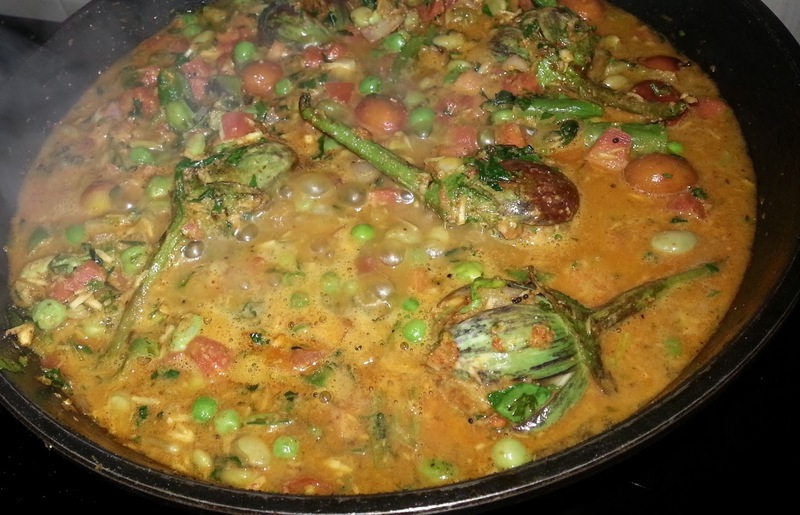 When the veggies are almost done add the grated jaggery and little salt. Be careful while adding salt , as we have already added in the masala. Give a quick stir and cook for another 2-3 minutes. Put off the flame. 5. Serve hot with baajri chi bhakri and enjoy ! !